"I invite you to read the book to accompany your understanding and application of the Alexander Technique in your life. Although it is primarily written for actors, its message is helpful to all types of performers and any current or potential student (or ‘pupil’ as you are called by your teacher) of the Alexander technique. It may be that you will not take Alexander lessons nor ever stand on a stage but for the general reader this book also offers useful references and guidance for everyday situations. 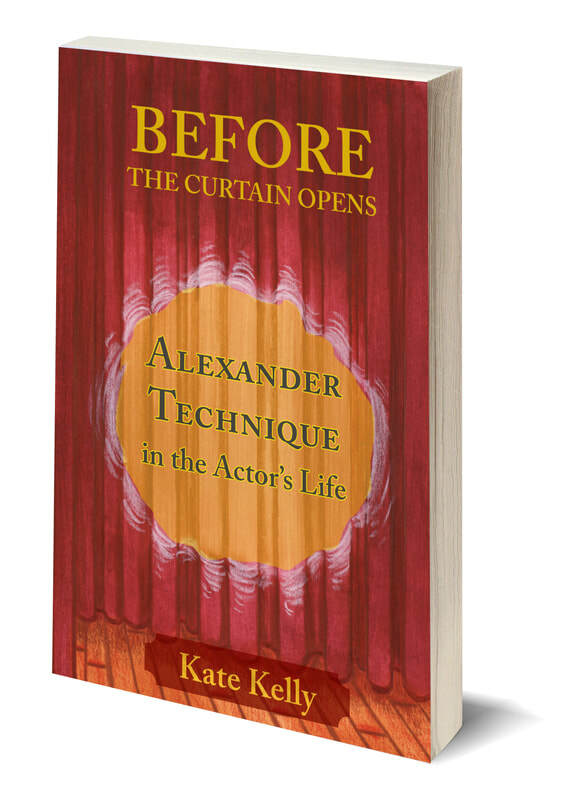 “Kate Kelly-Tanguay’s Before the Curtain Opens distils a lifetime’s lived experience of the Alexander Technique into an engaging and vivid introduction to what becomes a holistic philosophy of performance. A must-read for actors, drama students, and anyone who wants to feel more at easy within their own skin. Kate writes with a reassuring immediacy that makes your feel she is in the room with you”. "The Alexander Technique is a way of learning to change and retrain postural and behavioural habits that cause unnecessary tension, stress and illness. More than this, it is a form of conscious awareness and mindfulness avant la lettre. In this new book the Blake enthusiast and Alexander teacher Kate Kelly explores why Energy is Eternal Delight." The Alexander Technique is a long-established, accessible and highly effective way of learning to change and retrain postural and behavioural habits that cause unnecessary tension, stress and illness. Developed over a century ago by F.M. Alexander (who taught the technique to George Bernard Shaw, Henry Irving, Aldous Huxley and many others), the Alexander Technique is a form of conscious awareness and mindfulness avant la lettre. It has always been used principally by actors – though it has wide applications in other professions and in daily life. Kate Kelly has a lifetime’s experience as an actor and Alexander teacher. In Before the Curtain Opens, she invites performers of all sorts to examine the everyday habits of standing, sitting, breathing, speaking and reacting that spill over, unseen, into their professional lives. Using her own experience, miniature case studies, humour and unfailingly gentle kindness, she shines a spotlight on our deepest-rooted habits. On every page she offers advice, tips, techniques and guidance to help actors and performers retrain themselves in everything they do in daily life – before the curtain opens. ‘Before’ encompasses everything that goes on in your life, noticed and unnoticed. The following chapters are a resource of notes and reflections to draw on as you build your personal foundation of self-reliance and awareness to ensure the bubbles keep bubbling in life and performance. The actors discovered that something as simple as learning how to stop the unconscious habit of tensing their neck muscles in reaction to a thought or a situation, at intervals during the day, improved the fluidity and coordination of even small movements. Remembering at the same time the upward flow of the energy in the body is not only relaxing but allows them to speedily change their mind about moving or reacting. ​ Because of this repeated experience they can find, in years to come, creative choices influenced and enriched in all areas of their professional stage and screen work. The opportunity is there to support performance without the interference of unnecessary stress. Unnoticed or unconscious habits pervade our daily lives and thank goodness for many of them... we don’t have to think through every movement we make. The muscles have blueprints stored away for a myriad possible actions. Yet, if creativity is dependent on free choice, unhelpful habits begin to interfere with the process and they make the choices for us. ​ What is it about habit that gets in our way? First and foremost, it is an attitude, often a fixed way of seeing ourselves and the world around us. This translates into limited imaginative choices and even stiffness in movement. ​ Unnoticed habit becomes the dead end for creativity. It hampers the connection between imagination and expression. The only way this cul-de-sac can be avoided is if habit is identified and a stop put to these patterns of thought and activity. First of all, you have to accept that you are balancing on a rotating planet and that whether you know it or not you are never standing still. Even when you think you are, your system is making minute adjustments all the time, not only to the progress of circulating fluids in your own body but also to the changes beneath your feet. Gravity maintains your connection to the earth without you having to think about it and, when you take on responsibility for ensuring the freedom of your joints and ‘uprightness’, the bonus is that you also recover the ability to balance with much less effort. To balance within your own upright stature, use the reference point of 60% of your weight being taken by your heel bone (under the ankle joint) and 40% through the ball of the foot at the big and little toes (incidentally now your head can find its balancing point more easily). ​ Barefoot or in flat shoes play with this swaying backwards and forwards, never so far that your toes or heels come off the ground. Experiment anywhere with this redistribution of weight bearing: at the bus stop, waiting for the kettle to boil. Become used to the freedom of your ankles so that with this thought you are less likely to automatically tip forward as you speak, extend a hand or move. Crossing the legs often tightens the lower back and causes you to pull downwards in front. You will have a habitual and ‘comfortable’ side you like to cross a leg over. Deliberately choose the unfamiliar side which requires more awareness of what you are doing with yourself. ​This is a picture of my teaching chair. The artist who drew it, Lucinda Sieger, had Alexander lessons where we used this chair. She liked to call it Kate’s magic chair possibly because after a while she began to feel lighter as she stood and sat. I wasn’t teaching her the right way to sit and stand but with my hands-on guidance Lucinda recovered a freedom of movement that she had forgotten. As well as squatting and kneeling many of the human race - including musicians and actors - have been sitting on chairs and stools (never mind rocks and logs) for at least two thousand years. In past centuries, however, most of us were, by necessity, much more active in daily life and at different times in our history status determined who could sit and who would stand. Chairs were not the slouch easy sofas and armchairs we might have now nor did we spend so much time in them. So although you don’t learn how to get in and out of a chair in an AT lesson you do begin to appreciate how balancing on the chair with awareness rather than collapsing into it improves your functioning and outcome whether drawing, typing, or eating your lunch. This seated poise also activates your natural upward springiness when coming to standing. Every day magic!